Seven Lakes High School Biology Olympiad Club, Katy TX. 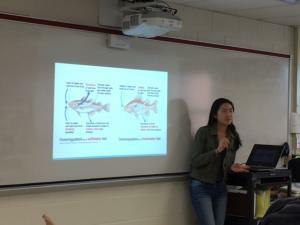 Lydia You presents lecture on fish anatomy. Identify a teacher or administrator be your club sponsor. Have your teacher or administrator register for the USABO. Register for the USABO once your teacher or administrator has registered your school. Recruit students via social media, posters and fliers. First, a student needs to have some courage and not be intimidated by the USABO. I believe rying out for the USABO is very tough and a student is not obligated by anyone to make it through to the next round. Second, there are more people who are interested in the USABO in your school than you think. I sent a post through my Facebook Wall and sent a post to the Science Olympiad team Group Page, the IB group page, and other Facebook group pages that might be interested in the Biology Olympiad. Third, I found a teacher that was willing to sponsor and set a fixed cost to cover the expenses of registration for the participants and set the date of the competition. Fifth, since our Science Olympiad team is very prominent among the Science Department in our school, I sent an email to all the Science teachers in our school asking them to mention the USABO to their students. Sixth, I designed a flier for the USABO and posted 80 of them around my school, and in classrooms. Click here to see my flier. Use these suggested resources to begin. Rebecca (Becky) Shi’s experience (First Place, 2011 International Biology Olympiad). Click here to read about Becky’s journey to the IBO. Nikhil Buduma (IBO Gold Medalist 2012 & 2013) from his talk May 1, 2014 at the Capitol Hill Luncheon, Washington, DC. Click here. Thomas Xiong's experience (IBO Gold Medalist 2016 & 2017). Click here to read Thomas' life lessons from the USABO and IBO. Visit the USABO site The information will provide an overview of the program for students. This year, the Student Resource Center is being updated with information regarding what to study and some tools to use for study. 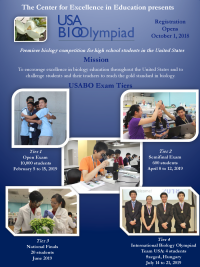 Visit the International Biology Olympiad (IBO) site to obtain an overview of the IBO. The USABO is structured similarly. The team should start to strategize and form a plan of study for the content to include resources, speakers, practice sessions, and lab time.